Should You Factor in What Type of Office You’ll Be Working in When Deciding Upon a Job Offer? When looking for a job, you’ll most likely pay more attention to the salary, hours and actual description of what you’ll be doing. However, did you know there’s another important factor you likely haven’t even considered? The actual office environment you’ll be working in is extremely important to consider. After all, it’s where you’ll be spending the majority of your time so you need to make sure you’re going to be happy (or at least as happy as you can be at work). Below, you’ll discover why the office environment is important when considering a job offer and what you should look out for. Why does office space matter? The type of office space you end up working in can have a significant impact on your health. It’s been proven through numerous studies, that the working environment can affect motivation, productivity, stress levels and happiness. One study carried out in 2008 revealed a negative work environment can lead to depression, insomnia and anxiety. A positive working environment on the other hand, will help you to feel valued, appreciated and you’ll be much more motivated to do the best job you can. So, if you find yourself in a negative working environment, it could have a significant impact on your life. The question is, what should you look out for when you visit a potential employer’s office? There’s a number of things you can look out for when you visit the office for your interview. Firstly, try to pay attention to the way employees interact with each other. Do they appear friendly and approachable? Do they know each other’s names and seem to have a good team spirit? It can be difficult to judge this, especially if you’re only there briefly. However, you can get an instant feel for the office environment as soon as you walk in. The way the office looks is also an important factor to consider. Is there plenty of natural lighting and does the office have a modern décor? 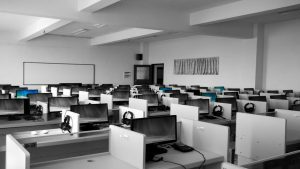 Ideally, you’ll want to look out for companies which use serviced offices. These come with a modern, fun design and also offer the latest technology. So, working in a serviced office guarantees you’ll be able to do your job to the best of your ability. Overall, while salary and hours are certainly important, it’s also crucial to pay attention to the working environment. It should definitely play a big factor in whether or not you accept a job offer.